Coming into care as a stray in November it was happy new year for Smudge who joined her new family in the first week of January 2014. Martine and Steve updated us after Smudge had been with them for two days, "Just to let you know Smudge is doing really well since we took her home Thursday eve, we are so pleased we saw her on your web site , she is eating well purring and giving us lots of love, such a lovely girl, thanks once again." It was great to get another update in March and another lovely photo of Smudge, this time enjoying some sunshine in the garden. 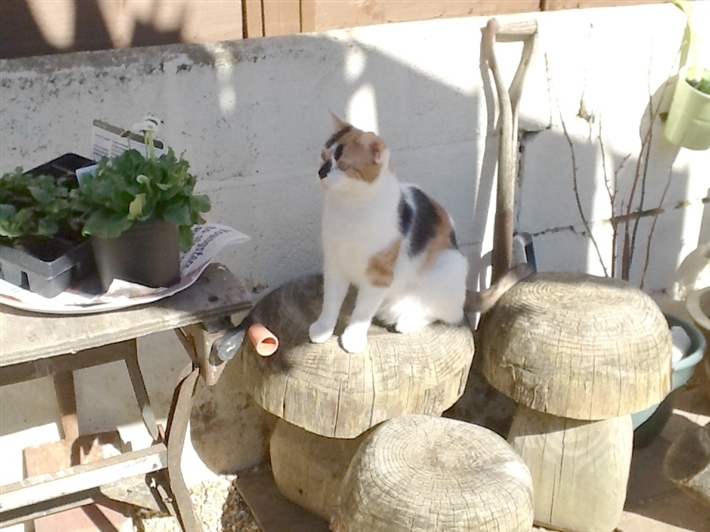 "Here is our beautiful Smudge now going out in the garden, she doesn't venture far but loves to climb and roll about in the sun, then comes in, has a big bowl of food and crashes out on the bed. She is a darling!" shade.Thinking of buying a king size bed though, as she takes up ALL the room at night and won't budge for anyone, but it's the cats house we only pay the mortgage as they say. Will send you a christmas piccy. We all love Smudge, she is our furry darling." Another year on, and January 2015 Martine & Steve say "Thought we would send you a update picture of our darling smudge, we have had her just over a year now, and she really is our loving spoilt rescue cat, she has gone from a shy timid cat, to the boss of the house, sleeps in bed with us and has her side of the sofa. she isn't keen on people visiting the house and retires to the bedroom, loves to play with her cat nip mice we buy from your stalls in Gosport. Thanks once again she is adorable"
Smudge continues to delight Martine & Steve who say she is still such a darling. Clearly she's Queen in her castle!